I have discovered a couple more weeds in the garden that are good for Rabbit snacks since my original post Weeds: Food For Rabbits and I have also discovered that several of these that Rabbits can eat are also edible for humans. One plant from the original post Weeds: Food For Rabbits, Greenbrier is absolutely delicious. The tender new growth, and the twirly tendrils it uses to hold itself up are very good tasting, even refreshing. It has also been used medicinally. 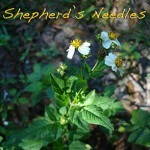 The weed Bidens Alba, or Shepherd’s Needles is a Rabbit plant. It is a pesky annual in the Aster family with needle shaped seeds that stick to you as you walk by it. It has a white daisy like flowers with a yellow center and it attracts lots of butterflies mostly in the summer months. It is very common here. Tea from it’s leaves may have medicinal properties. 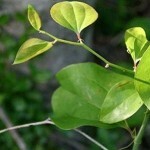 I read one reference for the plant that suggests that it may contain chemicals that suppress some types of tumor growth. The weed Lactuca Floridana, or Woodland Lettuce grows all over my yard, and the rabbits will always pick it out of a variety of weed treats first. 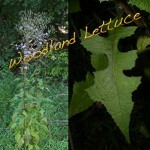 I just learned that it is a wild lettuce and we bipeds can eat it too. I had a taste and really liked it. It is pretty much like lettuce in flavor. Bon appetit bunnnies and bipeds. It is very cool how one discovers the variety of “fruits” if you will, that we can eat right in our yards. Sorta like the caveman experimenting with what foods are eatable and nutritious. Very cool vibe. We may be aquiring a bunny today (daughter’s b-day present) and I remembered your posts about bunnies here. Wouldn’t pigweed (a kind of amaranth I think) be okay for rabbits? Or is it off limits b/c it’s a grain, like corn? I have way too much of it in my gardens (we don’t like how it tastes) so I’d love to feed it to the rabbit! How wonderful for your daughter. I have offered my bunnies pig weed before. They seem to like it ok. I don’t worry about feeding them immature seed heads. It’s not like feeding big dry grains like corn which is definitely off limits. I did notice that the pig weed is not their favorite, but they will eat it if it is in the mix. My rabbits really love to eat grasses and they like those that have gone to seed in all stages, though I try to get it before the seed heads are fully released from the stalk, I have been growing wheat and I have been offering them wheat grass with and without seed heads. I don’t feed them any of the St. Augustine or vining grasses. I don’t know if it is bad or good for them, so I just don’t offer it. The weeds and greens I give the rabbits are supplements to their primary diet of Timothy hay. Timothy though expensive is the proper hay for rabbits. Feeding them alfalfa hay or alfalfa pellets is like feeding a child snickers bars. They love it but it isn’t good for them. Best of luck to you all with your new family member, and happy birthday to your daughter.